A grooving and orchestral piano trio fronted by a great bass player -- a stunner. Cohen came on the horizon for most jazz fans as the bass player on Danilo Perez's sweet 1996 album Panamonk. A year later, Cohen was debuting with Chick Corea's new acoustic group Origin, and then with the Chick Coreo New Trio. Having arrived in New York in 1992, Cohen was hardly an overnight sensation. But, happily, at the age of 38, Cohen still sounds utterly fresh and contemporary. Gently Disturbed comes, in fact, as a kind of revelation. First, it's not easy to create a piano trio record that sounds new. Everything that can be said in this format would seem to be out already, right? Yet here comes a straight-up acoustic trio that manages it, without going to some obvious extreme. The tunes, mostly Cohen originals, set out for fresh territory by avoiding the standard patterns of jazz harmony. They set up original basslines, lock together interesting patterns in the manner of classical music but with much great rhythmic sophistication, and build intensity through counterpoint, repetition and displacement. As a result, the group never gets to sounding typically "funky" or rocking, yet they still generate a great deal of heat. The overall sound, however, is not some kind of effete chamber jazz. Cohen and his band mates have found an ideal middle ground that seems, somehow, unplowed. Take "Pinzin Kinzin", a tune collectively composed by the trio. It starts with a simple-sounding bass part in a time signature with 14 quick beats, grouped irregularly. With the entrance of the piano and drums, however, it becomes harder and harder to understand how the group is chopping up those 14 beats into any logical pattern. Just when things may be getting lost, the instruments begin playing in a hard driving unison that seems funky, followed by a jagged divergence. In its own way, the tune "rocks", except not at all in the way that, say, the Bad Plus uses the energy of rock. This seems more the mark of a group that locks together exceptionally well but is also not afraid to use a generous dose of technique and complication when it serves the energy of the music. If Cohen's "Chutzpan" hints at his time with Chick Corea in places, it still never seems baroque or overdone. There is a passage toward the end where every instrument is essentially playing a drum solo, and it raises hairs. Much credit must go to the young pianist Shai Maestro and drummer Mark Guiliana. Maestro is just 21 and, like Cohen, Israeli. His touch is confident but lyrical, audacious but within tradition. On "Umray", Maestro begins with a touch of impressionism, but he keeps the tune moving and trades improvised passages with the leader with ease. On "Eleven Wives", however, he plays with rhythmic assertion, dominating the trio with both hands playing emphatically. Guiliana performs with a combination of melody and explosion. Dig him on "Gently Distrubed", where he plays behind the steady three-against-four time of Cohen and Maestro in a freewheeling solo of muted bombs and rolls that contrast richly with the simple melody. His work on "Eleven Wives" carries traces of fusion bombast, perhaps, but he is mainly under control on these tunes, playing with intricate ease. On "Structure in Emotion", for example, Guiliana lays out at first, then merely colors with his cymbals before kicking in with a grooving pattern that remains tight and spare beneath Cohen's solo. 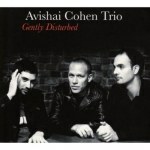 Part of the freshness of Gently Disturbed comes from the two lovely traditional Israeli songs that the trio converts into compelling jazz balladry. "Lo Baiom Velo Balyla" begins as a mournful sounding waltz for piano, but the trio soon enters to create a sense of graceful movement and swing. The bass solo is rich (with superb recorded sound here and throughout), and the piano solo is even more lyrical, with Maestro at his most Bill-Evans-ish. "Puncha Puncha" has a similar folk directness, using intervals that sound somewhat like the blues, even though they come from a different culture altogether. These tunes allow the trio to get away with some gentleness without sounding icy or stagnant like the recent European trio records on ECM. The tunes here that sound the most composed, such as "The Ever Evolving Etude", are still playful. "Etude" works a bit of rhythmic trickiness, with the trio dropping in and out of double-time and the whole band sounding like a carnival even though they are working with passages of great complexity. "Variations in G Minor" is somewhat similar, an obsessively arpeggiated piece that is carefully written but has the rhythmic excitement of straight jazz. The Avishai Cohen Trio is hardly alone in suggesting the different ways that jazz can move forward without simply rehashing the traditions that are firmly centered on four-four swing rhythm, blues, and the harmonies of the American songbook. Cohen, Maestro, and Guiliana use all of those ingredients, certainly, but they infuse their music with enough classical influence, music from around the world, and contemporary energy to make it fresh. The absence of straight walking swing, for example, doesn't make this music sound unlike jazz. It just helps to remind us that music is still evolving in 2008, and -- let's hope -- picking up listeners along the way.